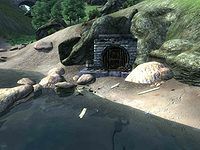 The North Tunnel is a medium-sized sewer system north of the Imperial City containing bandits. It contains two zones, both of which have the same name: The North Tunnel and The North Tunnel. This sewer system is the northernmost entry point to the sewer system under the Imperial City. In particular, it provides access to the Market Sewers. Although you must make it past two locked doors, this is typically the easiest way to get into the Market Sewers. As with most sewers, this system contains many crates and other containers. However, only those marked on the maps have a chance of containing loot other than clutter. The entrance is locked with a leveled lock (average-level lock or harder). This location's map marker (M on map) is named Imperial City Sewers - North Exit (editor name IMPSEWMapMarker). The entrance door is S of the marker, 10 feet away. You enter this system through the door at Out. 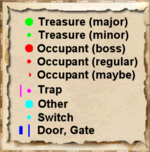 To progress, you will need to work your way south to door C. This will require opening a sewer gate (E), using the adjacent Turn Wheel, and opening the locked gate at G.
The only notable treasure in this zone is all in the northwest room: two boss chests (B) and a Nirnroot (N). Although the map makes it look like you can access this room from the south, those two connections (grayed-out in the map) are both underwater tunnels that are too low to get through. 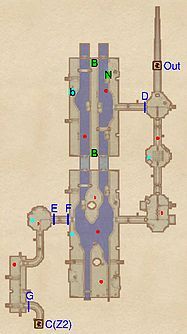 Therefore, the only way to access the boss chests is from the east, by opening gate D. That gate can be opened using the Turn Wheel (cyan dot) in the middle room of the three eastern rooms. One sewer Gate (at D), opened using the Turn Wheel (cyan dot) in the next room to the south. Two sewer Gates (at E and F). Both gates are controlled by two Turn Wheels (cyan dots), located on either side of the gates. You will generally enter this zone at the north end, through door C. It is a straightforward path from there to the final room, containing both doors D and E into the Market Sewers. Door E is the best door to use to enter the Market Sewers. There is no notable treasure in this zone. Door E is the upper level door (at the top of the stairs), and is the door that you will need to use to gain full access to the Market Sewers.